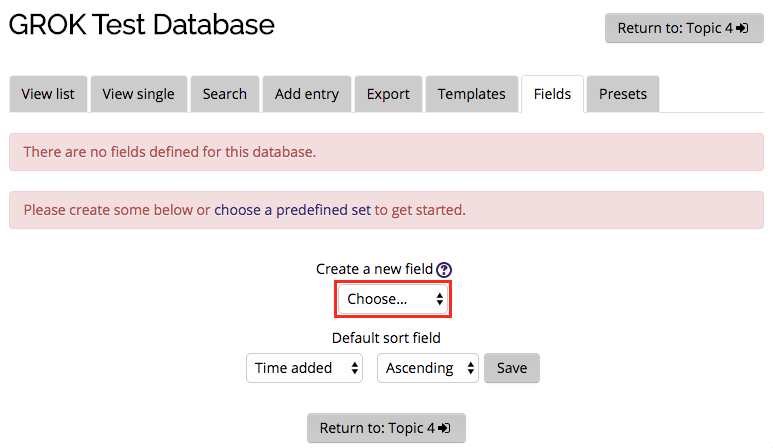 After creating a Database in Moodle, you must add Database Fields that define everything about the entries you wish to collect. 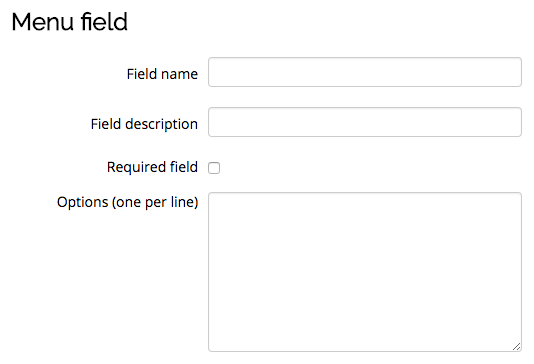 There are several Types of Fields. These fields include Checkbox, Date, File, Latlong, Menu, Multimenu, Number, Picture, Radio button, Text area, Text input, and URL. These fields can be defined individually or a Database Preset may be used instead in which you can alter appropriately. 1. 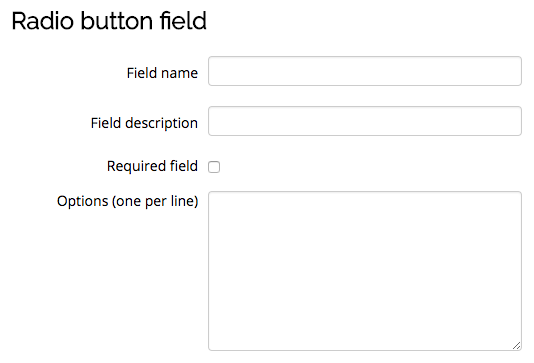 To create a new field, navigate to the Fields tab in the Database and select an option from the Create a new field dropdown menu. 2. Fill out the Field settings as necessary then select the Add button. 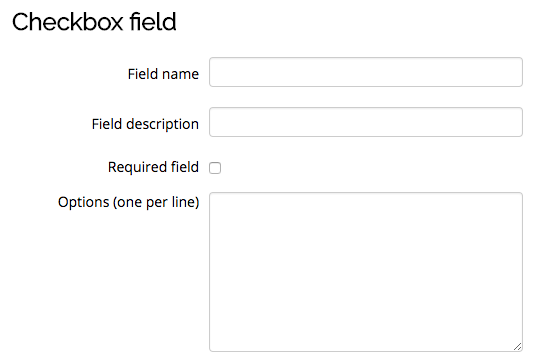 Checkbox: This field allows you to offer checkboxes for the user to select. Date: The date field allows the user to assign a date to the entry using a Day, Month, and Year dropdown menu. File: This field allows the user to upload non-graphic files from their computer. 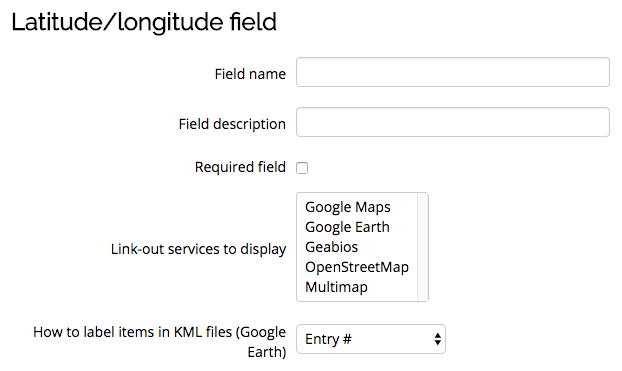 Latlong: This field allows the user to assign geographic locations to a database entry using latitude and longitude coordinates. Links are automatically generated linking to geographic data services such as Google Maps, Google Earth, GeaBios, OpenStreetMap, Multimap and more. NOTE: The administrator can choose which of those links appear, if any. Menu: This field allows the user to choose from items presented as a drop-down list. Each line in the Options textbox becomes a different menu option. 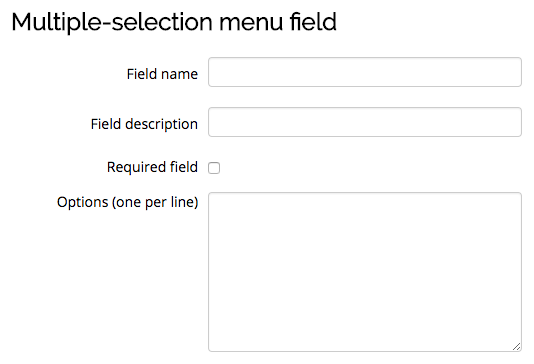 Multiple-selection Menu: This field allows the user to choose from items presented as a drop-down list. Each line in the Options textbox becomes a different menu option. By holding down control or shift as they click, users will be able to select multiple menu options. Number: This field allows the user to enter a number. These numbers are stored as floating point numbers. 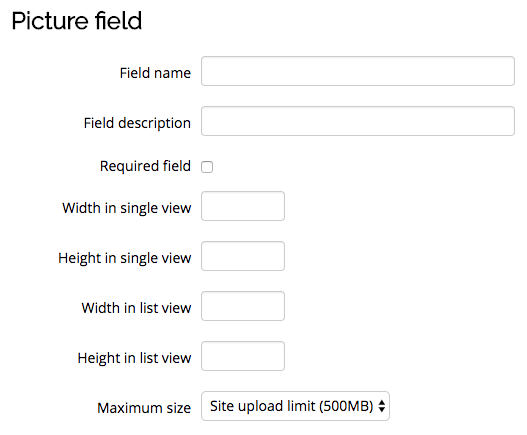 Picture: This field allows the user to upload and display a picture file entry. The administrator may set single view (pictures are viewed individually) and list view (pictures are viewed together) height and width dimensions as well as limit the upload file size. Radio button: This field allows the user to select a radio button which is a graphical control element that allows the user to choose only one of a predefined set of options. Each line in the Options textbox becomes a different menu option. Textarea: This field allows the user to enter long piece of text using the text editor interface. The administrator may adjust the maximum embedded file size and adjust the size of the interface. Text: This field allows the user to enter a line of text up to 60 characters long. If the user wishes to enter more than 60 characters, they may use the Textarea field. URL: This field allows the user to add a link to a website here. 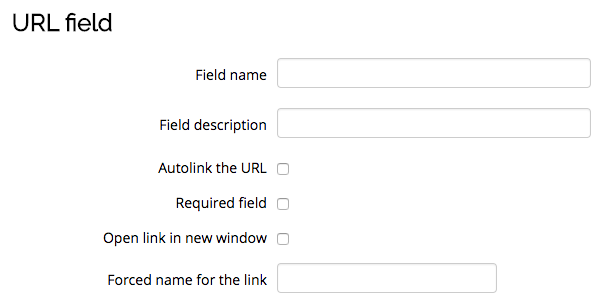 If you select Autolink the URL then the entry becomes clickable. If you also enter a forced name for the link then that text will be used for the hyperlink. You may also choose to have the URL open in a new window if so desired. 1. 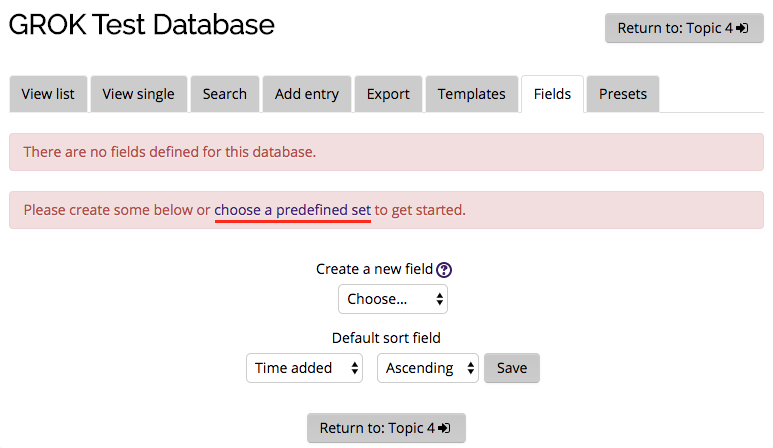 To use a preset, select the choose a predefined set link in the Fields section of the Database. i. If available, select one of the presets. ii. If there are no available presets, you may import a .zip file preset by selecting the Choose a file... button and browsing to the .zip file containing the preset (eg. "preset.zip") stored on the server. 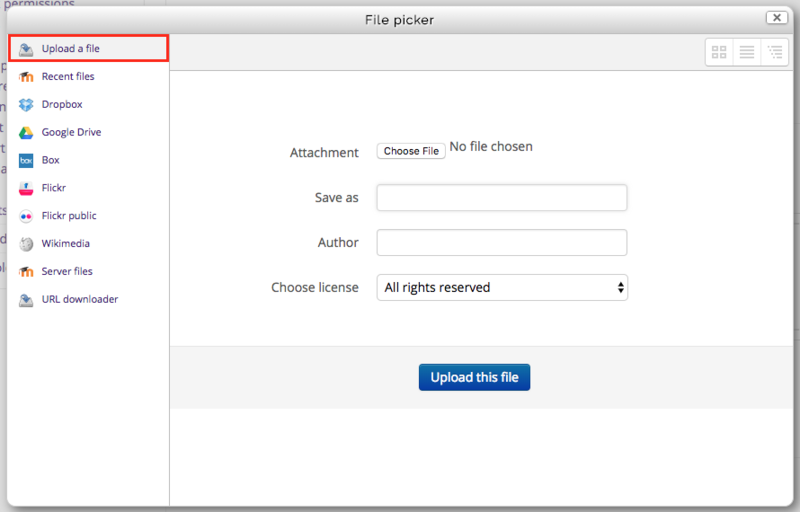 Select the Choose a file... button, navigate to the Upload a file tab, choose a .zip file preset on your computer from the file browser and select the Upload this file button. 3. Select the Choose button.